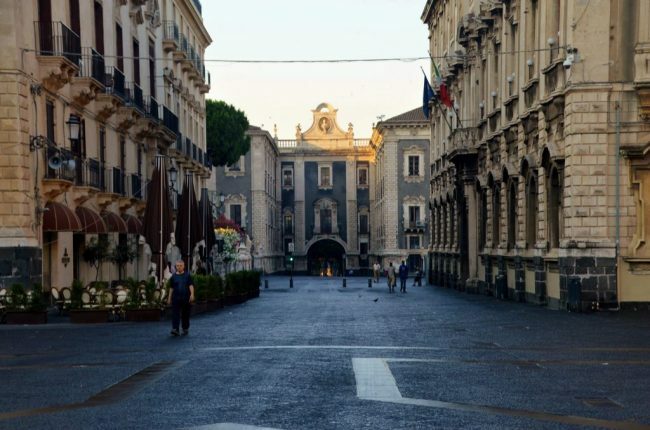 Catania, on the eastern coast of Sicily, is one of those cities that is often overlooked for its more glamorous neighbours of Taormina and Siracusa. 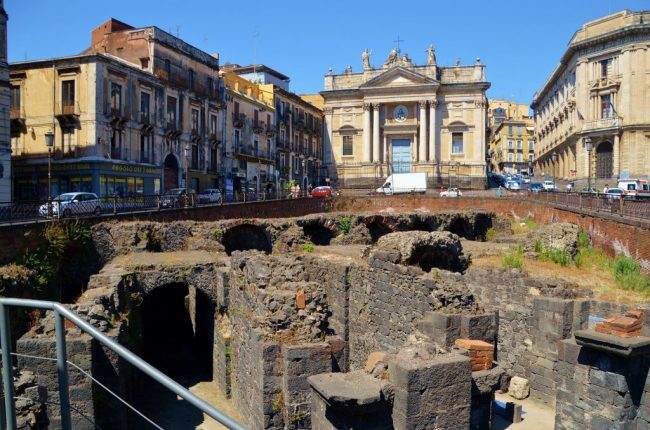 It’s a city of a bit over 300,000 people, and Catania – Fontanarossa is the main airport. 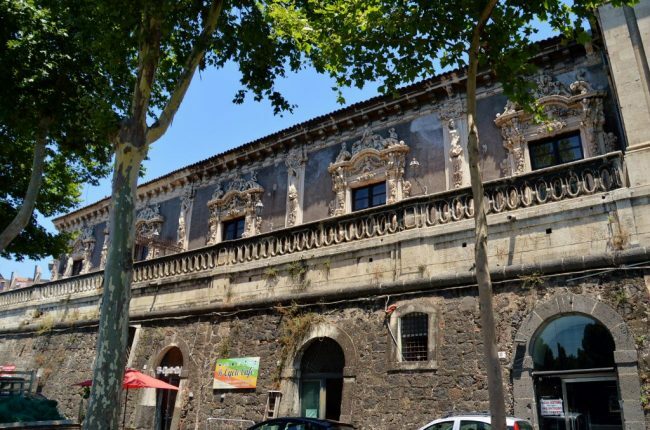 However, Catania offers a lively buzz with interesting monuments, full of history, and numerous places of interest. There is so much to see, but with just a few days, I’ve whittled it down to 10 things to do in Catania, Sicily. 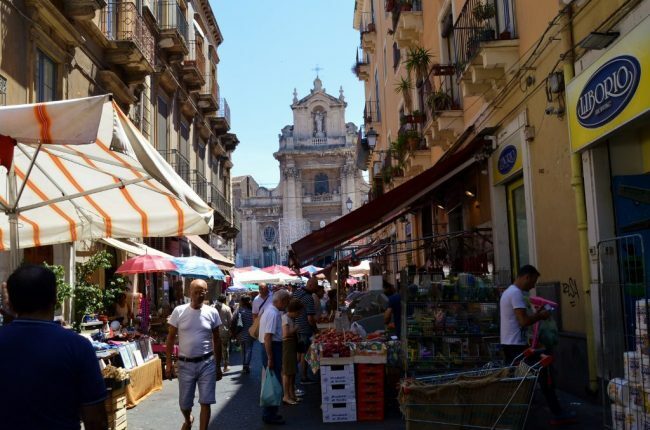 2 Is Catania worth visiting? 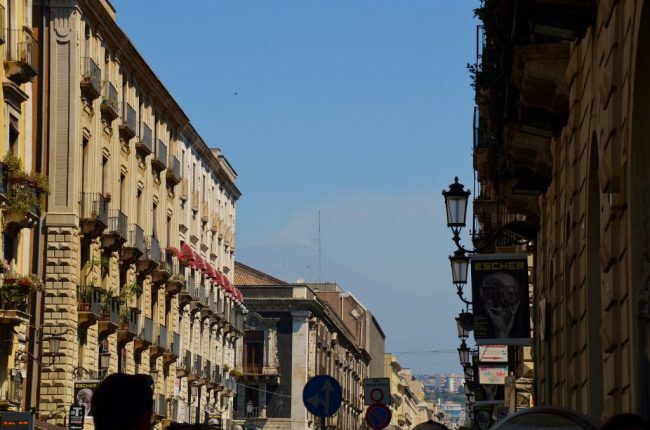 Catania sits precariously within spitting distance of the still active volcano, Mt Etna. It’s an extraordinarily historic city with roots dating back to the 8th century BC. Much of the city was destroyed in the 1100’s and late 1600’s due to various earthquakes and volcanic eruptions, and much of the architecture you see today is from the late 1600-1700’s. It’s a great base for exploring the eastern part of Sicily, so take your time. I was last here 30 years ago and didn’t know what to expect. I remember it felt unsafe, dirty, and the air was heavy to breathe. It was almost as if I was sucking in sticky air full of particles from polluting cars, vespas, disintegrating buildings and hints of volcanic ash. And the fact I arrived here 30 years ago with no clothes didn’t help, either! My guard was up. Thirty years on, and with a fresh perspective, I’m quite impressed with Catania. This town, like many, has made numerous improvements in housing development, infrastructure, traffic limitations and international dining options. I was lucky enough to have an old friend from London, Mario, a Catania native, show me around. There is still the charm of old, crumbling buildings from the 1600-1700’s, which I now appreciate. But they are alongside lovely manicured parks, beautifully cleaned-up cathedrals and palazzi, statues and fountains. There’s even a ‘main drag,’ called Via Etnea, which is primarily pedestrian, and Catania now has a subway system. While the weather in June is scorching hot, you’ll find many places to take refuge under the trees of many welcoming, lively outdoor cafes and restaurants. I have to mention that I’m sneezing a lot, here, and I don’t have a cold. My system is not used to this air, still full of ancient particles. This city moves! Traffic moves, buildings move, dust moves. Situate yourself in the center of town off Via Etnea. 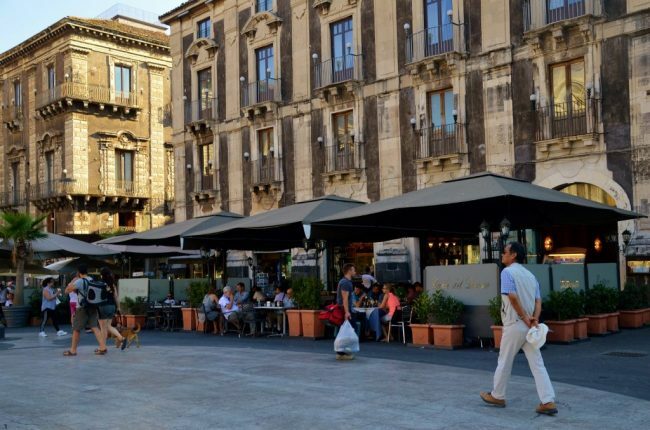 This is the most convenient area to discover Catania, and Via Etnea is now primarily pedestrian. It runs North/South and the city is easy to navigate. Don’t get me wrong, Catania is still a gritty city, and somber in it’s esthetics and architectural tone. Much of the building blocks come from Etna’s black lava, so the foundations of most buildings are black block and streets are the same. I am staying at Il Gattopardo House at 10 Via Minoriti, and it is lovely, clean, and very reasonably-priced. It’s just 20 ft from Via Etnea. The rooms are large and your bathroom is down the hall. I don’t usually choose this type of accommodation, but it was more important to be as central as possible, in a busy area where I’d feel safe, without spending an arm and a leg. It isn’t a problem and the bathroom is well-kitted out. The hotel even offers a bath pack including a bathrobe so you can wander the hall dressed appropriately. Depending on how long you plan to stay, it’s worth considering renting an apartment with cooking facilities because the market options are truly enticing. I paid $125 for a 3-night stay. Deal! 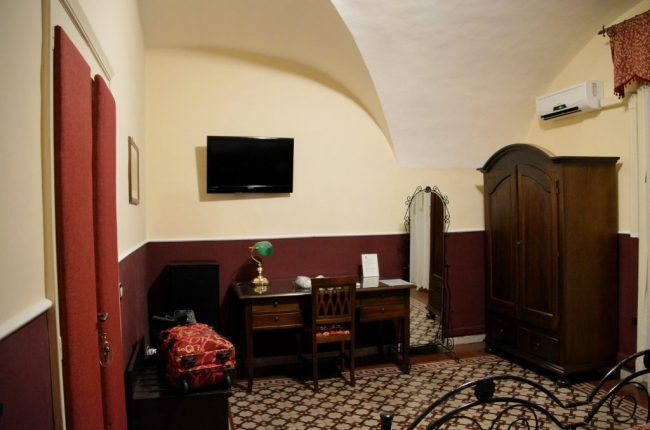 You will find a lot of reasonably priced places to stay in Catania. Stroll up and down Via Etnea to see the latest shops and get your bearings. All the hotels have maps to show you where you are. People walk in the middle of the street, except for when police and transport vehicles need to pass. At the south end you find the main Cathedral of S. Agata. At the north end, you will get a glimpse of smoldering Mt. Etna, which is a good thing. If steam is not coming out, the locals worry that she is up to no-good! Starting from the south end, stop in the main Cathedral of S. Agata – Saint Agatha. The Cathedral is a Baroque structure which was originally built in 1078, and rebuilt over the years due to various earthquakes and eruptions. 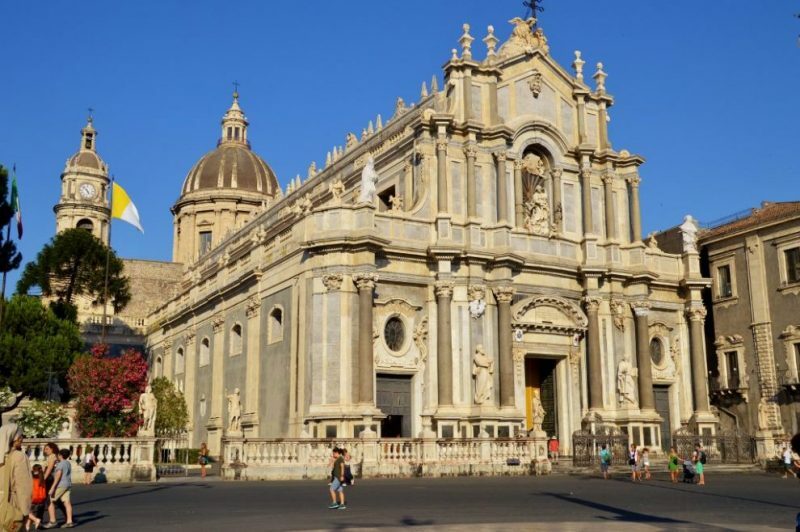 It is the seat of the Archbishops of Catania and its current structure and interior date from 1711. The dome dates from 1802. It’s magnificent inside and is actually the 3rd largest cathedral in Italy behind St. Peter’s Basilica in Rome and the Milan’s Duomo Cathedral. Inside you find beautiful canvases, various monuments, and among others, the tomb of the famous Catanian opera composer, Vincenzo Bellini. Doing things backward, I strolled in around 6p and caught part of the Thursday night mass. The choral singing and music coming from the huge organ was amazing. There were some serious clergy inside and the procession was impressive. 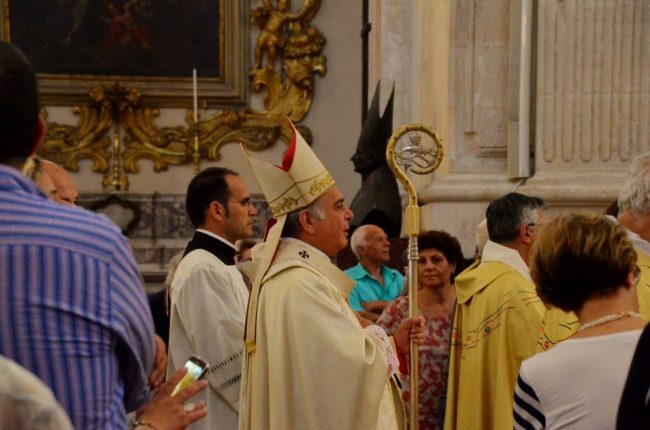 Even if you are not Catholic or religious, it’s worth observing how important the church is to Catanians and experience part of their daily life. 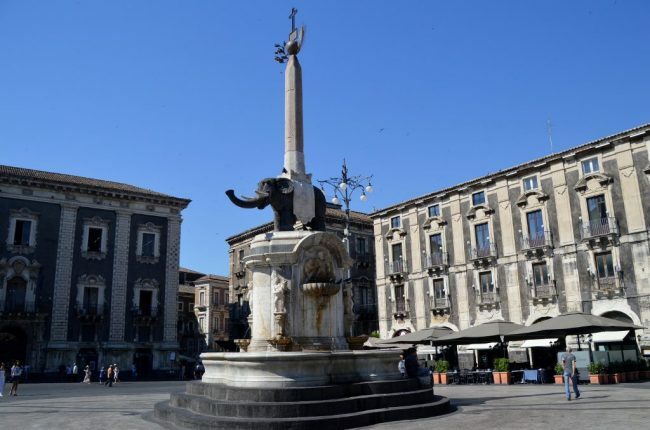 Just outside in the Piazza del Duomo you’ll see the Fontana dell’Elefante – the symbol of Catania – made from volcanic lava. The elephant symbolizes longevity – longevity of this ancient city. For a bit of old-world charm, stop and admire La Pescheria, the fish market, straight opposite S Agata on the other side of Piazza Duomo. Go between 8a-12p and watch some serious fish buying going on. There were fish mongers literally throwing fish to one another as the demand comes in. It’s a great way to experience a long-standing Italian tradition where some things never change. Early in the morning, you see early risers watching market preparations. The smell is strong and you’ll see mongers in ‘Wellies’ as well as flip-flops walking around the soggy, bloody market. The per-pound prices are ridiculously cheap, and I am wishing I had cooking facilities at home to give a few of the fish a try. 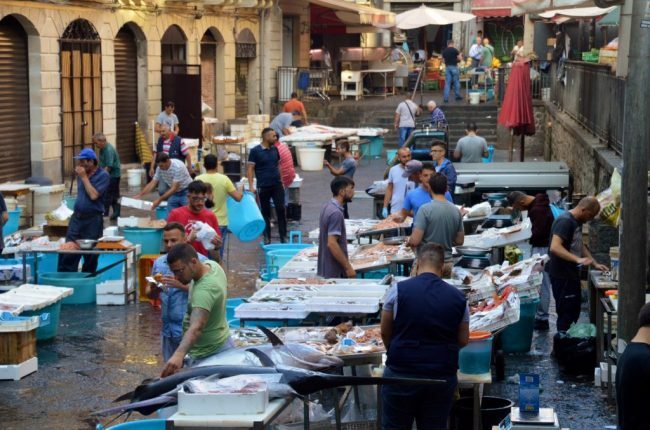 There is another, larger market with fish, meat, veggies, clothes and household items on Via Pacini off of Via Etnea. That must have been where I bought my ‘grannie undies’ 30 yrs ago. 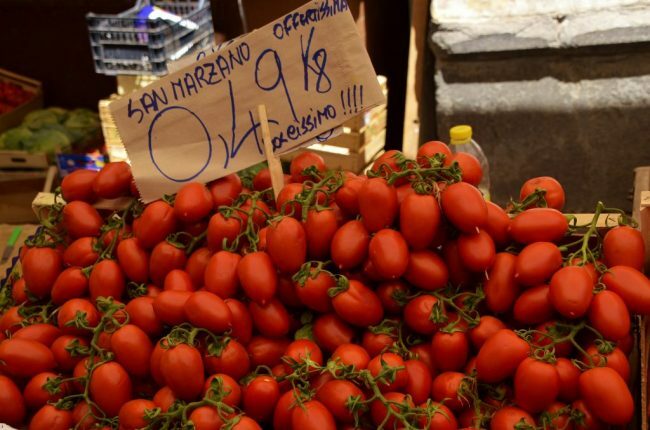 Tomatoes for a steal at the central market – €.49 ($.57) for 2.2 pounds! 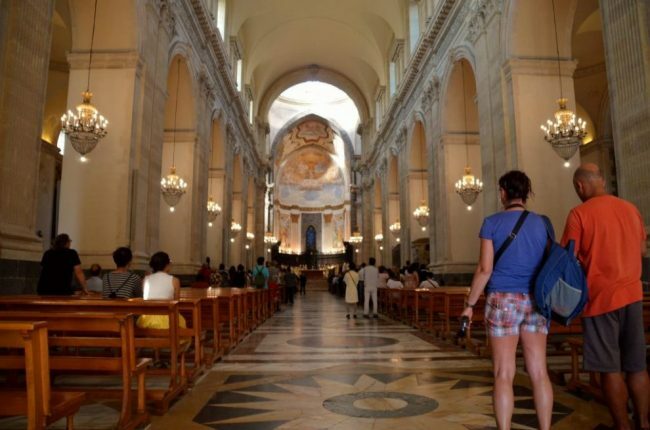 Due to the size of Mount Etna you can take a variety of organized tours from Catania. You can do 1/2 day and full day organized tours of Etna. If you are more adventurous you can also hike up Etna or see Etna from a 4×4 Jeep. Companies will provide you with all the safety gear you need to visit this must-see natural wonder that is ever erupting. 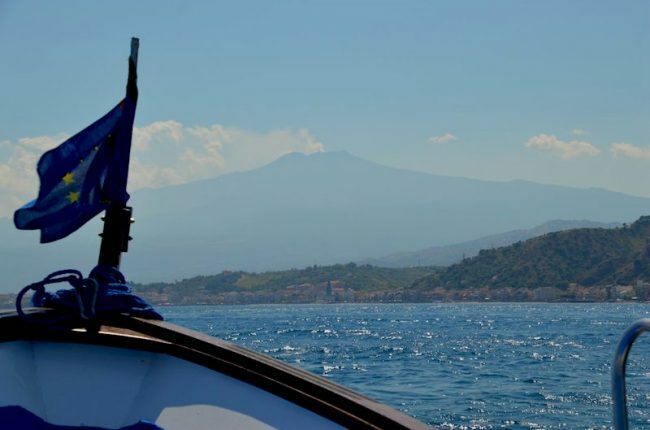 As Etna has been more active as of recent, you need to play your visit according to the safest ways and days to visit. Right now, I’d recommend an organized tour as the operators know Etna’s activity and know when to go and not. 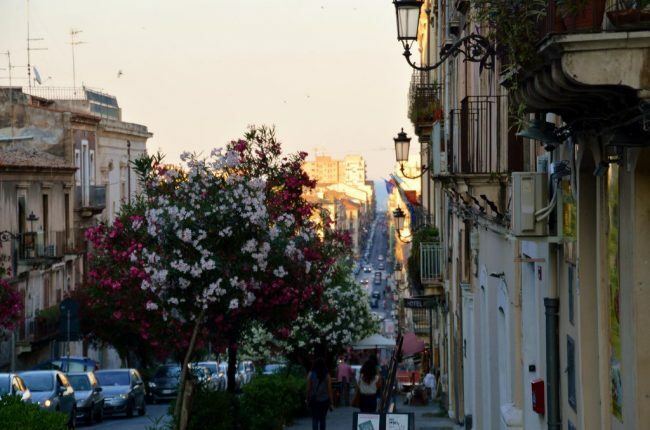 And while we are talking about visiting areas near Catania, why not visit Siracusa for a week? They say it’s the hottest city in Sicily! Be sure to take a break for a late morning snack with a traditional Sicilian treat at the Cafe del Duomo, just in front of S Agata Cathedral by the fish market. 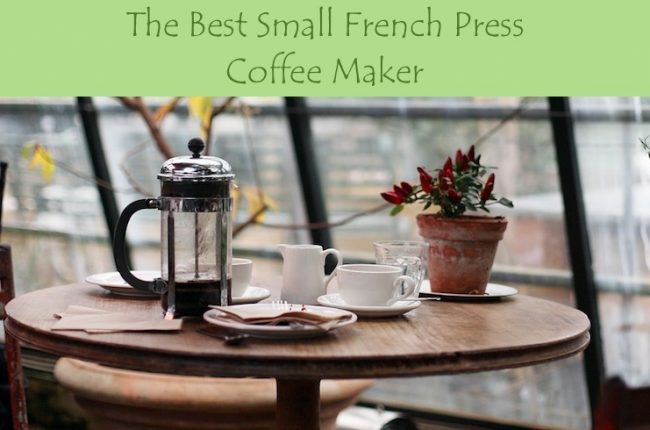 I say start later, because you may think it’s a bit decadent first thing in the morning. 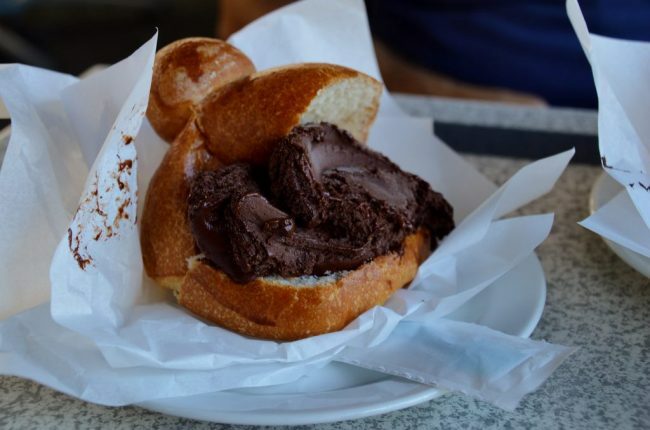 It’s a traditional sweet brioche chock full of gelato, yes, ice cream for a whole €2 ($2.25). I wanted a croissant, but Mario changed my order. I had no idea what I was getting, so I chose chocolate, whatever it is. And it is so naughty and nice. I ordered a cappuccino and fit right in. For a supposed, low-calorie option, order a lemon granita, but the thought of having a lemon ‘snow cone’ melting in my sweet brioche was not appealing. Stick with ice cream. When you go north up Via Etnea, you’ll come across the ruins of the Anfiteatro Romano in Piazza Stesicoro. These ruins are from 300 BCE, as it’s referred to: Before the Common Era, and made from the lava stone that flowed from Etna after the eruption of 252 BCE. It’s a quick view and then you can turn around and see the Statue of Giuseppe Garibaldi, who was instrumental in the unification of Italy. Continue further north up Etnea and you will come across the gardens of Giardini Bellini Villa. 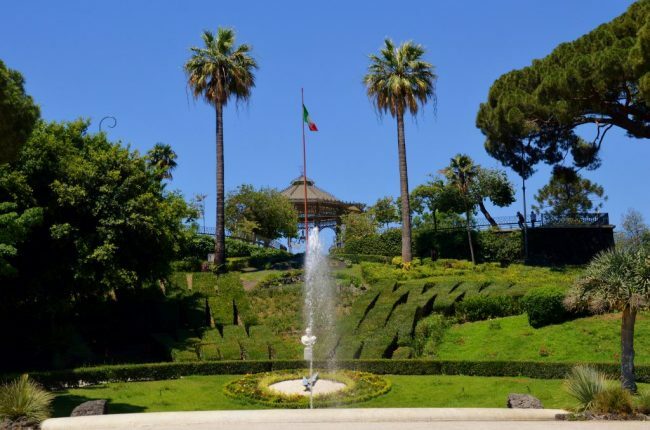 The University of Catania’s Botanical Department maintains these lovely gardens and they host a variety of summer concerts. It’s nice for a wonder around. Turn around, cross the street and go back south until you come to Corso Sicilia at Pizza Stesicoro by the Anfiteatro Romano and turn left, or continue a bit further to Via Antonio San Giuliano just off Etnea heading toward the Teatro Massimo. While you are weaving, you will find one of the many traditional kiosks serving a local tasty beverage. I tried two yummy treats; one is a ‘Mandarino al Limone’ and the other a ‘Limone al Selz’. 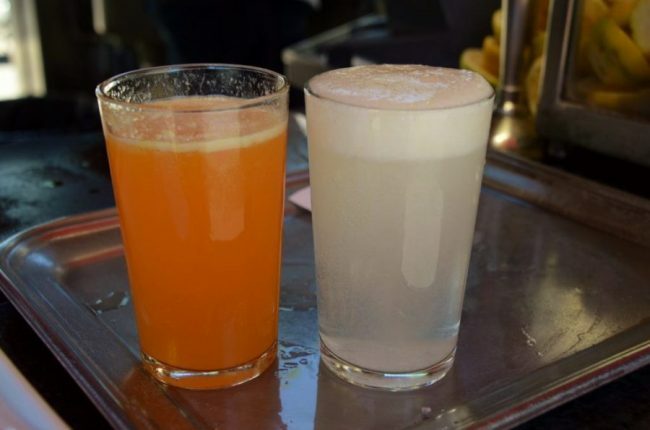 Mandarino al Limone is a carbonated sweetened orange with lemon drink, and Limone al Selz is a salty, effervescent lemon drink – think Gatorade without the sugar or a lemony Alka Seltzer. Both are great, and very unique. You find these kiosks dotted around town, and locals come here to catch up on a bit of gossip, news and of course, sports. To be honest, it is full of a bunch of guys. Who’s complaining?? Continue on until you find the beautiful Teatro Massimo in Piazza Bellini. 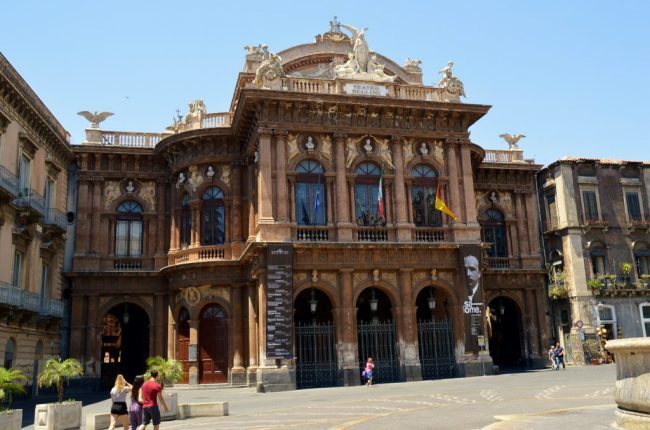 The theatre opened in 1890 and you can enjoy a variety of opera, concerts and other events throughout the year. Even if you don’t get a chance to see a performance, you can admire it’s lovely exterior architecture. Vincenzo Bellini was from Catania and is known for his opera’s of Norma, I Puritani, Il Pirata, La Straniera and others. If all of this walking seems like too much, don’t fret. 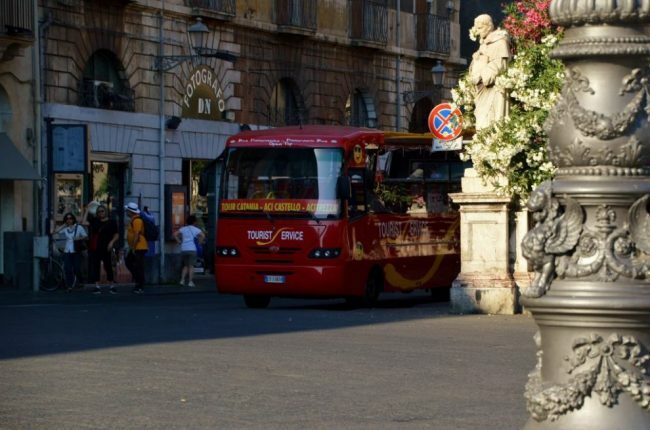 Catania has two tourist transports; a 40-minute train tour that will hit these same spots and a few more with commentary in 6 languages for $5.75. There is also a Hop-off, Hop-on bus, which covers these points of interest, as well as offers a sea view route up the eastern coast to see the black lava stone of the Faraglioni area with it’s cobalt blue seas to Aci Castello, which dates back to 1647, and finally to the the fishing village of Acitrezza. The ticket costs$17.50 for the day, and is well worth it. You can find more information about both means of transport at www.touristservice2006.com and both leave from the Piazza del Duomo. 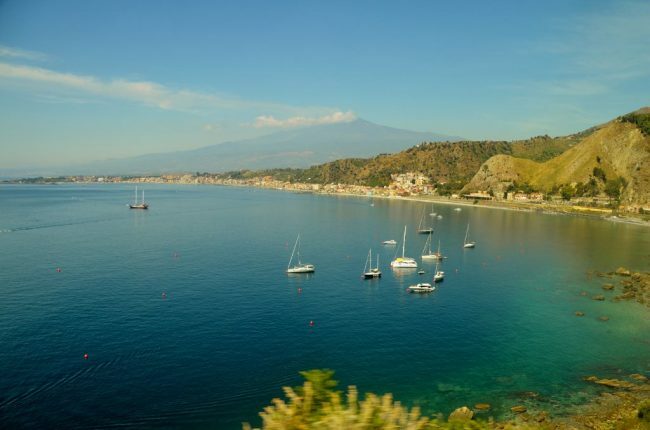 If you wish to explore further, read my article on Taormina. How to get there and when to visit. For a unique culinary experience in Taormina, take a cooking class with Gian Luca, the owner at the Red & White Hostaria. And while we are on the topic of Italy, if you are traveling in the Veneto area and have only a day to visit Venice, please check out Greta’s Travels on What to do in Venice in One Day. She has some great information of the best-see attractions to get the most out of a single day in Venice. Be sure to check out her YouTube channel as well. Great fun videos packed full of information. Great read! Any place that served ice cream for breakfast (and a bunch of guys) is ok with me.